This week has been a sifting and a shifting week for us. Sifted my refrigerator while shifting to a new place to make use of the many ingredients staring at me from the shelves, demanding an instant makeover. 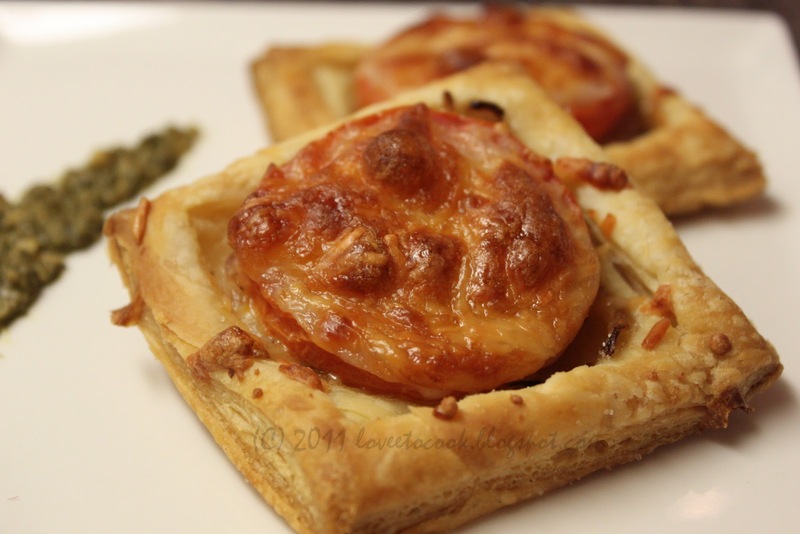 Among them- Puff pastry, dozen tomatoes, cheese and immediately i knew together they can make some sweet music. So pastry squares and a creamy tomato bisque gave way for a cozy dinner date with my husband beside our warm fireplace. An experience grander than all the chic and upscale dinners we have had outside. I detail the recipe of pastry squares here, soon to be followed by the recipe of the bisque in my posts later. Heat a medium sized pan with olive oil, add the sliced onions, garlic and stir frequently on medium heat till all the moisture is evaporated .The onions will soon caramelize (get browned and sweetened).Sprinkle salt, pepper and thyme. Remove from heat. 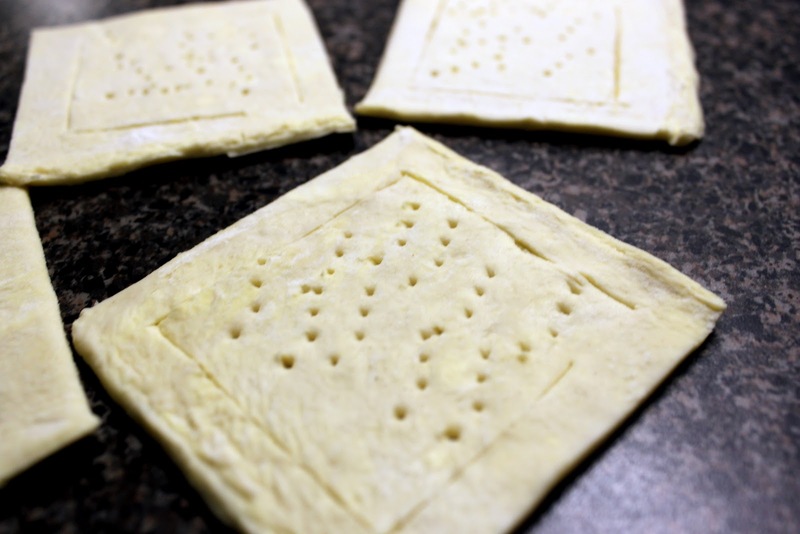 Take the thawed pastry and cut into equal squares or to your desired shape. I prefer squares as it assures no wastage whatsoever. Place all the squares on a lined sheet pan. Score a 1/4 inch border on each of the squares,leaving the inner and outer squares still connected. Now prick the inside of the squares with the help of a fork. 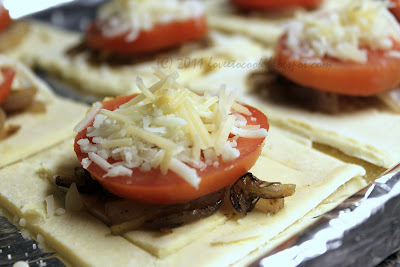 On the scored part, place some caramelized onions and top it with a slice of the tomato. Brush some oilve oil and sprinkle salt, pepper on each tomato and top it with grated cheese. 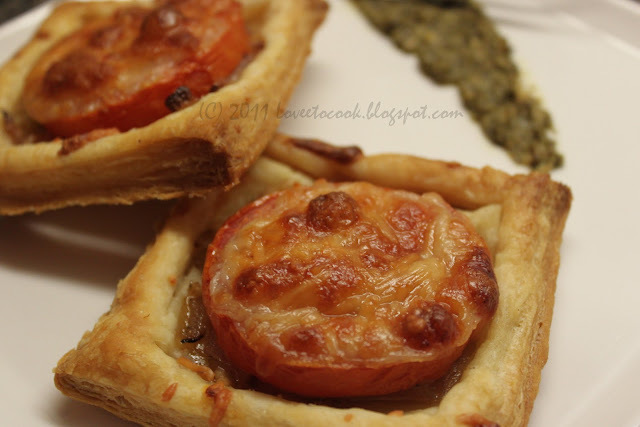 Place the prepared pastry in the oven for 20-25 minutes till golden brown and serve hot along side some warm creamy soup. Wow..look so delicious...just waiting for ur india visit!